This post is being published concurrently at Public Eye, the CBS News blog dedicated to examining the issues that affect journalism and broadcasting. If you’ve been feeling edgy lately, one contributing factor may be the heavy dose of meaningless mayhem you watch on the typical local television newscast. Statistically speaking, I found in a quick bit of number crunching, you are about 50 times more likely to view a local TV news story about a murder than one about science, child care or pollution. You are roughly 20 times more likely to “Eyewitness” a fire than a report on education, discrimination or marriage. 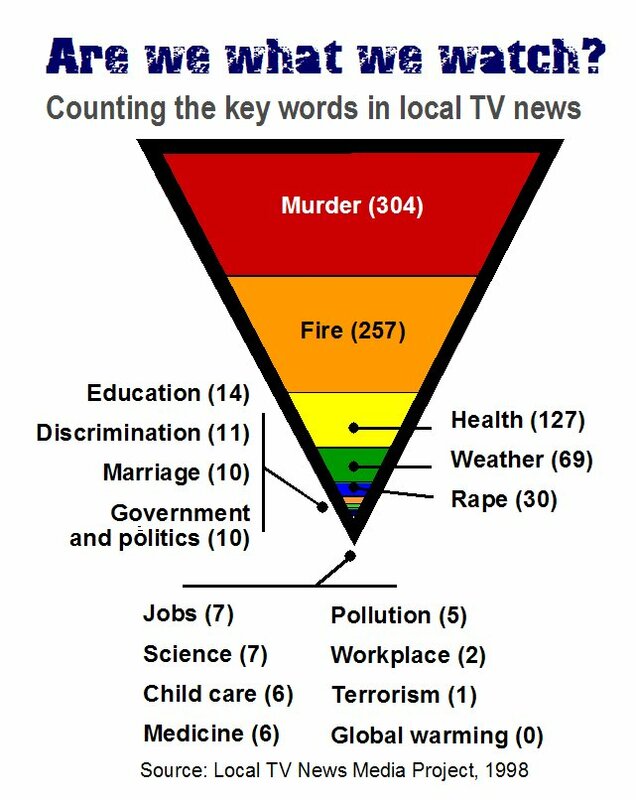 Confirming the not-so-subliminally scary tone of many local newscasts, I found that stories about murders, fires and rapes actually dominated more than two-thirds of the coverage I sampled. The distressing results are depicted in the graphic below. My analysis was conducted by using an index of more than 600 broadcasts at 61 stations in 20 markets. Assembled in 1998 by the Project for Excellence in Journalism, the database now is hosted by the Local TV News Media Project at the University of Delaware. Because the survey was completed in 1998, there are some limitations. The word “terrorism” shows up only once and “global warming” is absent altogether. Had the project been conducted any time from late-2001 until President Bush won his 2004 campaign against evildoers, the results for “terrorism” would have been more plentiful. Now that Al Gore is starring in a major motion picture on global warming, the subject may become more popular in the future. Or not. While newscasts are obliged to give an unvarnished view of the world, their primary mission is, and ought to be, to report and reflect in an accurate, balanced fashion on the issues and events that affect their communities. They fail miserably when they lead with a bleed and follow with a shooting, a fire or some other equally unimportant – but fast-breaking, telegenic and easy to produce – form of mayhem. A steady diet of scary but insignificant yarns not only unsettles viewers but also portrays a dangerously unrealistic and unhealthy view of world. It doesn’t help, either, that the real-life havoc featured on the local news abuts prime-time schedules filled with fictional fisticuffs, shootings, rapes, kidnappings and homicides. News directors may argue that edgy fare enhances their ratings and the profits that range up to 50% in many markets. But the high-def anxiety generated by their low-brow coverage represents not only a great danger to our democracy but also to our collective mental health. :: Six out of 10 Americans cite local TV as their primary source of news, according to the Pew Research Center for the People and the Press. :: Local TV tied with cable news as being the most trusted source of information, according to a poll by Frank N. Magid Associates for the Carnegie Foundation. Specifically, 21% of respondents gave top marks for trust to each of local TV and cable news, as compared with only 9% for newspapers. When the news gives a twisted view of reality, anxious and ill-informed individuals are susceptible to social and political movements that cause society to act in irrational or inappropriate ways. History is packed with examples of how fear-fueled misinformation led to dangerous demagoguery – and worse. In but one example, Dr. Yanich argues that over-the-top cop coverage has been a major factor in encouraging government to shift scarce resources from improving schools to building prisons. You don’t have to be a rocket scientist, or even a social scientist, to see that frightening and distorted coverage aggravates our collective angst at a time when we have enough real problems to worry about – like losing our jobs, educating our kids, paying our mortgages, filling the gas tank and, yes, terrorism and global warming, too. TV news ain’t show biz. Viewers take it very seriously. Broadcasters should, too. In selling the first four of the dozen Knight Ridder papers it plans to divest, McClatchy Newspapers appears to have realized a tidy pre-tax profit of about 21% in just six weeks. McClatchy is selling three KRI papers in California and one in St. Paul for a total of $1 billion, or 11.5 times the operating earnings achieved by the papers in 2005, according to the company’s press release. Because McClatchy is buying the papers from Knight Ridder for 9.5x operating earnings, MNI is in line for a pre-tax profit of approximately $175 million. That’s a 21% gain since agreeing to buy Knight Ridder six weeks ago. In the period since McClatchy cut the KRI deal, its stock has dropped 16% to close Wednesday at $44.71 per share. The $1 billion transaction was announced after the close of trading. When the market opens Thursday, will 21% prove to be McClatchy's lucky number? Disclosure: I own shares of both McClatchy and Knight Ridder. I screen, you screen, we all scream for more screens. Or, do we? For years, researchers have tried all kinds of experiments to substitute good, old-fashioned ink on paper with some sort of electronic, pixellated, plasmatized gizmo that marries the readability and portability of print with the flexibility and timeliness of an interactive display. The most recent variations on this long-running theme -- discussed yet again today in the New York Times -- even include a flexible e-newspaper that looks like a steam-rollered mousepad. It appears to be so pliable that a newsboy could roll it up, slip a rubberband around it and toss it under the bushes. While it is heartening that newspaper folks increasingly recognize the need to compete with the interactive, mobile media, they need to stop trying to evolve their product into a unique, specialized instrument that requires its own power supply. Instead, they need to start putting news and advertising information onto the mobile platforms that people actually are willing to carry around. As publications adapt to online and mobile presentation, they would be well advised to adapt their content to the native strengths of the medium in which they are to appear. In revising its web site, the New York Times ditched its traditional long, gray lines of type in favor of short and colorful displays that billboard a number of articles and make navigation easy. Like many other major newspapers, the NYT is introducing video and other multimedia features. At the other extreme of the continuum, Information Week, which ought to know better, is delivering a 96-page, PDF-style email containing an identical copy of its magazine, thus forcing readers to click through dozens of pages of slow-loading ads to squint at virtually unreadable text. Remember what Louis Henri Sullivan, the father of the skyscraper, said back in the 19th Century? "Form ever follows function." Awfully good advice. Loath as I am to pass along cutsey things I get in my email, I thought the copy editors among ewe wood enjoy this. Don't no the author, sew eye kin knot give credit wear its do. As if timed to coincide with the centennial of the Big One in San Francisco, there are several bits of earth-shaking news to discuss. All signs point to the likely imminent purchase of the San Jose Mercury and the Contra Costa Times by MediaNews Group, which already owns 22 other papers serving some 320,000 readers in Northern California. The acquisition of the Mercury, the CoCo Times and their little sister, the Monterey Herald, would bring MediaNews circulation in the market to well over 650,000, surpassing the reach of the soon-to-be-encircled San Francisco Chronicle by roughly 100,000 readers. For those who have been out of the galaxy, the Mercury et al are owned by Knight Ridder, which was forced by restive investors put itself up for sale. When McClatchy Newspapers bought Knight Ridder, it decided to divest a dozen of the KRI properties. This put the NorCal papers into play, along with properties from Philadelphia to Aberdeen, SD. MediaNews has done a bang-up job of acquiring several of the dailies surrounding Los Angeles in places like Van Nuys, Pasadena, Long Beach and San Bernardino. Now, it appears poised to reprise the feat in NorCal. Operating in mostly non-union environments where it aggressively shares editorial, ad sales and production resources, MediaNews is known for its ability to wring substantial expenses and high profitability out of its properties. Leveraging these and other efficiencies like tight newsholes, the company is an aggressive competitor for both advertising and circulation. If you want to know how that plays out, see “Roll” below. By purchasing the three KRI orphans, MediaNews literally will surround the once-dominant and now profitless Chronicle on the north, east and south. The nearest competitor to the west is the Honolulu Advertiser, so at least one flank is safe. Wall Street investors urged the New York Times to scrap the two-tier ownership structure that gives the Sulzberger family separate, but in some ways more equal, control than accorded to the company’s common shareholders. Translation: Investors feel the family’s indulgence in such luxuries as deep staffing, far-flung bureaus and generous newshole is limiting profits, thus depressing the value of the company’s shares. In addition to the Times, similar family-ownership structures are credited with contributing to the quality journalism crafted at Dow Jones, McClatchy and the Washington Post. To pressure NYT directors to abandon the dual-class share structure, Morgan Stanley and other holders representing a total of 30% of the common stock refused to approve the slate of directors nominated at the annual meeting. This action didn’t immediately change anything. But it is the same type of message that Tony Ridder, the soon-to-be-former CEO of Knight Ridder, failed to heed when shareholders told him in April, 2005, to raise the value of their stock – or else. Three mortal enemies improbably have joined forces to collectively corral the preprint advertising business in Los Angeles. Preprints are the advertising circulars you find larded in the Sunday newspaper or stuffed in your mailbox. Under the new deal, the L.A. Times, the MediaNews papers in the market and Advo, the nation’s leading direct mail service, will produce and distribute packages of circulars to homes on a sub-Zip Code level (meaning advertisers can pick and choose households down to a single block). Prior to this surprising truce, each of the three parties vigorously competed against one another for this growing and important class of advertising. Why did they suddenly decide to make nice? You guessed it. Ditto, doubtless, for the publishers. It’s not a bad deal for advertisers, either, who can improve the efficiency and accountability of their initiatives. With newspapers and Advo jockeying for higher profits across the country, don’t be surprised to see more such deals in the future. The canoodling likely will go well beyond Advo and the newspapers. As we enter a frenetic era of tectonic media realignment, deals are thisclose to being cut among publishers, broadcasters, mobile phone operators, cable companies, telcos and even the Yahoogles of the world. Is your earthquake kit packed? In an age of increasingly asymmetrical journalism, it’s time to create a two-tier system for awarding Pulitzer Prizes. The first tier would include only papers headquartered in New York and Washington, the select fraternity that this year collected seven of the 15 awards for excellence in journalism. The second tier would include all the rest of the newspapers, whose best work, while definitely not second rate, seldom makes the cut when the medals are dished out. The big boys and girls tend to get about half the prizes year after year, because they take good advantage of their inherent unfair advantage. They not only have bigger and better funded staffs than the provincial press, but they also get to cover the stories of the biggest national and international significance. When the Pulitzer jury had to decide this year which paper merited the prize for investigative reporting, the advantage went to the Washington Post for exposing the Jack Abramoff lobbying scandal, a story with evident and far-reaching significance. Left behind were the Los Angeles Times investigation of irregularities in the management of the J. Paul Getty Trust, the world’s richest art museum, and the stories about bungled hurricane aid in the Ft. Lauderdale Sun-Sentinel that led to indictments and promised reforms. While not taking anything away from the value of the work generated in NY and DC, I would argue that it is just as hard – and maybe even a little harder – to break a big story at a smaller metro or local paper, where the staffs are leaner, where the daily production pressures are greater and where, consequently, it is harder for reporters and editors to allocate the time required to pry stories out of obscure documents and reluctant sources. Indeed, it may be easier to be an investigative reporter in a leak-rich environment like Washington than anywhere else in the world. While many commentators are moaning that the economic and emotional difficulties surrounding the newspaper industry are endangering the future quality of journalism, it is clear that the great papers in NY and DC will continue to aspire to greatness and that the rest of the press likely will rise to the challenge when greatness is thrust upon them. A year ago, nobody would have ranked the New Orleans Times-Picayune and Biloxi (MI) Sun Herald as among our most hallowed journalistic institutions. But the staffs of both papers more than earned their Pulitzers by responding with passion, compassion and perseverance when Hurricane Katrina devastated their communities. The heroic response of the Gulf Coast journalists proves that most news folks have it in them to do exceptional work. It shouldn’t have to take an act of God to inspire ordinary journalists to greatness – or for them to win a Pulitzer. The research outfit, PQ Media, says the combined spending on blogs, podcasts and RSS feeds totaled a whole $20.4 million in 2005 and will grow to fully $49.8 million this year. You can buy the report for the introductory rate of $895. Assuming PQ is CQ*, how much revenue does the average blog gross? That depends on how many blogs you think there are. It turns out that the estimated number of self-published efforts ranges wildly from 34 million to 144 million, depending on who’s counting and how they do it. Podcast Alley has indexed 17,551 podcasts, so we'll treat them as a rounding error for the purposes of the following analysis. Technorati says it tracks 34 million blogs. If you divide $20.4 million by that number, the average revenue per blog is 60 cents per year. If PQ is right, bloggers can look forward to grossing an average of $1.46 this year. The Blog Herald reckoned that up to 144 million blogs had been created worldwide as of October, 2005. The survey reports that there are 3,500 blogs in Brunei, 15,000 in Denmark, 700,000 in Iran and more than 6 million in China. Adjusting for the number of abandoned efforts, the Blog Herald has settled on 100 million as a nice, round figure. If so, then the average blogger from Brunei to Beijing collected 20 cents in ad sales last year and can look forward to pocketing half a buck in ’06. That, plus another 75 cents, will get you a bus ride in San Francisco. Notwithstanding the Lilliputian size of the me-media business at the moment, PQ projects that it will grow to $757 million in sales by 2010. Who knows? They might be right. Until then, bloggers would be well advised not to quit their day jobs. Several widely celebrated new web sites are out to bring the miracle of frictionless commerce to the daunting task of shopping for a new home. Some day, these sites, or something quite like them, will revolutionize the real estate business by completely eliminating the need for agents – or at least squeezing their commissions to a few hundred bucks from the 5% they cheerfully collect for peddling million-dollar fixers here in San Francisco, the Bubble by the Bay. While agents ought to be concerned about the long-term threat to what must be the world's second-oldest profession, they can rest easy for now. The quality of the consumer experience at the online realty sites is so sketchy, so incomplete and often so utterly wrong as to make them nearly useless. If the operators of these "services" don't fix them, they will be squandering a most excellent opportunity. Since I, like everyone else, am in the market for a million-dollar fixer I can turn into a $1.5 million showplace with a few tasteful touch-ups, I was motivated by an article in today’s Wall Street Journal to take a look at Propsmart.Com, Oodle.Com, Trulia.Com and Zillow.Com. Of the group, Propsmart is the most worthless. Listings for nonexistent San Francisco addresses showed up in Marin County on the other side of the Golden Gate Bridge. A click on a link sent me to a listing on Craig's List that expired in February, which is equivalent to a prehistoric epoch in Internet and real estate time. Data at Oodle is so thin that there's no point in consulting it. Next. Trulia seems to be the best of a mediocre breed. Although the data seems limited to a few sources, at least the houses are in the right county and links actually worked. Pictures and selling prices of previously sold houses are archived; that's a great feature. Zillow is nifty if you are lucky enough to stumble onto a listing that's in its database. The problem is that this has happened only once out of perhaps a dozen times in my experience. I understand the urgency that entrepreneurs feel to grab land quickly in the online real estate rush. But these creaking fixers are going to need a lot more than a fresh coat of paint. Are newspaper stocks at bargain-basement levels or merely at a subterranean stopping point as they melt ever closer to the core of the earth? In the interests of full disclosure – and so you can conveniently calibrate the quality of my insights by consulting the stock tables fast disappearing from newspapers but now readily available at Google and many other online locations – you should know that I was one of the lonely guys in the last few weeks who bought shares of McClatchy, Knight Ridder and Scripps while the stock market was pummeling most of publishing group. Now you know where I stand on the question posed in the opening sentence. In the interests of even fuller disclosure, I also want to report that I served as an adviser to one of the private equity firms that considered buying Knight Ridder when it went up for sale late last year. Apart from the posting immediately below, I stopped writing this blog during the engagement. Any comments regarding Knight Ridder in this post or any subsequent items will be based solely on publicly available information. Although the very best days for newspaper companies arguably have been behind them since the first TV stations went on the air, the industry has the commercial strength, growing resolve and emerging wisdom to refit its estimable franchises as significant competitors in the 21st Century and beyond. The combined value of the publicly traded newspaper stocks dropped $2 billion in the first three months of the year to $70.8 billion, as detailed in the table below. The aggregate decline is but $278 million short of the entire enterprise value of McClatchy (MNI, $48.85), which bravely – and, I would argue, astutely – is buying two-thirds of Knight Ridder (KRI, $63.21). KRI was forced to the auction bock by investors displeased with the desultory performance of its shares. 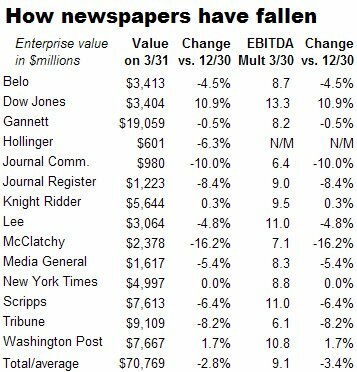 To give you a sense of how far the once-mighty newspaper stocks have fallen, Lee Enterprises just 14 months ago bought the St. Louis Post-Dispatch and the rest of the Pulitzer chain for 13.5x EBITDA (earnings before interest, taxes, depreciation and amortization). That’s roughly 28% less than the 9.5x EBITDA that MNI intends to give for KRI. In 1990, if memory serves, McClatchy paid something north of 20x EBITDA for some papers it coveted in South Carolina. Notwithstanding this comeuppance for publishers, it is worth noting that more than a third of the stocks in the Dow Jones Industrial Average actually trade at lower values than the price at which KRI is slated to change hands. If the $6.5 billion KRI transaction is completed on the originally announced terms, the target will be sold at approximately 9.5x EBITDA, a value greater than that of such DJI companies as Verizon (4.5x EBITDA), Exxon (4.9x), Intel (6.2x), Home Depot (8.5x), Pfizer (8.5x), AT&T (8.6x), McDonald’s (9x) and Du Pont (9.2x). Stock prices, of course, climb when investors think a company is about to be taken over. Thus, it is fair to note that the valuations of any of the companies used in this example would rise significantly if they went into play. With MNI trading at 7.1x EBITDA and the newspaper group rated at an average 9.1x EBITDA, even a quantitatively challenged journalism major like me can see the potential upside. Doing the math, I also determined that KRI is trading at approximately $2 per share less than MNI has promised to pay for it. Yes, there is risk that MNI may stumble in selling the dozen newspapers it has elected not to keep, but early indications are that several parties are interested in them. Succumbing to the same bargain-hunting mentality that inspired my purchase of MNI and KRI, I bought Scripps (SSP, $44.71) when it recently hit an air pocket. Unlike MNI and KRI, which are pure newspaper plays, SSP, which derived only 27% of its sales from newspapers in 2005, has become one of our leading "un-newspaper" companies. Perhaps the most prescient of its peers in envisioning a future of targeted, narrowcast media and unlimited consumer choice, SSP years ago launched the successful HGTV the Food cable networks. It then acquired the Shopzilla online shopping service and recently bought uSwitch, a UK-based company that helps consumers shop for loans, credit cards and such services as utilities, telecommunications and cable TV. If you think the shrewdest thing for a newspaper publisher to do is to get out of the business entirely, then the most visionary of all is Thomson Newspapers. Thomson unloaded all of its newspaper assets by 2001 and has turned its attention to delivering financial data, medical journals and other specialized trade publications. Although Thomson could be right, the rest of us could be wrong and newspaper stocks could continue to fall to ever-lower lows, the fundamental business proposition remains appealing. Newspapers typically enjoy near-monopoly franchises, control the largest share of advertising dollars in a market, attract the most traffic of any local web site and, even in the most challenging markets, generate strong, consistent and reasonably predictable cash flows. Not many businesses can boast that. We actually believe that in a world filled with way too much information – much of it inaccurate – delivered via more media and channels than any one consumer can possibly manage, the editorial skills found in the newspaper industry could prove to be very valuable. Study after study has shown that the average consumer actually doesn’t like to have too many choices, which is exactly what the Internet provides. In the long run – and recent research suggests that this has already started – consumers will gravitate to a handful of trusted information sources for their news. We suspect that newspapers like The New York Times, The Washington Post, and The Wall Street Journal will benefit from this, as will local newspaper publishers. For the sake of our democracy, if not to mention my meager stock portfolio, I hope Morningstar is right.